Thomas & Friends is a favourite brand in our house. It's one that we all love to sit down and watch together and one that continues to appeal to homes around the whole country too. When we found out that there was going to be a Thomas & Friends Christmas DVD of course we couldn't say no to a review. Thomas & Friends: The Christmas Engines is a compilation of 5 Christmas themed tales that feature our favourite blue engine and his friends getting up to various escapades and making sure Christmas runs smoothly on the Isle of Sodor. Each episode is broken up by awesome intervals that include a quiz by the Earl and postcards. This makes it seem like it's a movie rather than a series of episodes. We settled down with a mug of hot chocolate and marshmallows, popped on our fairy lights to get in the festive spirit and popped on the DVD. Max absolutely loved it, roaring with laughter and shouting for them to hurry up before Santa arrives! It's definitely a great Christmas pick me up DVD that would be perfect for a stocking filler or Christmas eve box. 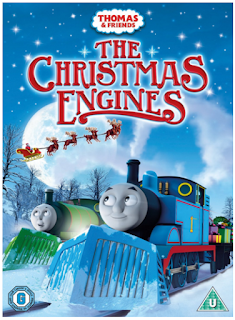 Thomas & Friends: The Christmas Engines is released on the 26th October and at under £10 it's a great price too!